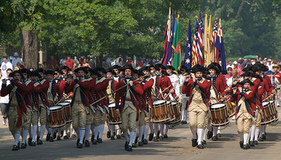 See below for Colonial Williamsburg Package Deals, Military Discounts, and more ways to save on admission! Wigs. Definitely wigs. Wigs and melting pewter spoons. Oh, sorry. Got a little stream-of-consciousness there. Wigs and pewter spoons were the highlights of our most recent visit. Why did we LOVE the wig-maker on our recent trip? Look below to find out...plus details on our Top 5 Places to see there. For ticket info, scroll down. 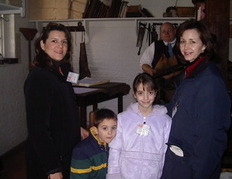 For my Secrets of a Cheap Colonial Williamsburg Vacation, including how to get in for free, look below. If you're wondering what else to do in Williamsburg, here's a detailed overview of other Williamsburg attractions, including ghost tours, "Revolutionary City," Great Wolf Lodge, Haunted Dinner Theater, Busch Gardens, Paramounts Kings Dominion, Prime Outlets Williamsburg, and Kingsmill Resort & Spa. And if you're looking for somewhere to eat outside the Historic area, look below for my two favorite cheap-but-fantastic Williamsburg restaurants...plus others rated "Best" by local residents. Part of Virginia's Historic Triangle (which also includes Jamestown and Yorktown), the Historic Area is a one-of-a-kind spot. It's like they froze 18th century America (before it was America) and then thawed it out just for your visit. And it's chock-full of history. Imagine walking down the shell-strewn streets where Thomas Jefferson, George Washington, Patrick Henry, Benjamin Franklin and other heroes of the American Revolution strode from secret meetings in smoke-filled taverns and inns...and into a revolution that shook the world. The Printmaker's Shop is one of my favorite sights at Colonial Williamsburg. But this historic wonder almost didn't happen. While Williamsburg became the second capital of the new English colony of Virginia (after Jamestown), over the 19th century, things started to fall into disrepair. Luckily, ol' Money Bags--John D. Rockafeller--saved the day. In 1926, he financed the restoration of the town's Colonial section, even rebuilding certain attractions--like the Governor's Palace, which had burned down--with exhaustively researched detail. 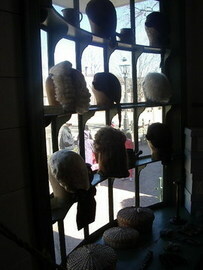 Do NOT miss the Wigmaker's Shop at Colonial Williamsburg. My favorite spot in the Historic Area, you'll flip for it! Click here to learn why I recommend these spots! #1 Place to Skip - the Gunsmith's Shop - Personally, I have nothing against guns. I base my advice to skip this shop on the fact that the last two times I've visited, the same costumed interpreter "gentleman" running this shop was downright unfriendly and unhelpful (face it, if you're paying $35-$45 (depending on the time of year you visit) you should be able to ask the interpreters a few questions, right?). Admission Facts, Plus How to Get in for Free! Williamsburg isn't cheap, especially for a family. A lot of visitors purchase tickets ahead of time, assuming that they'll need tickets to see anything. Nothing could be further from the truth! 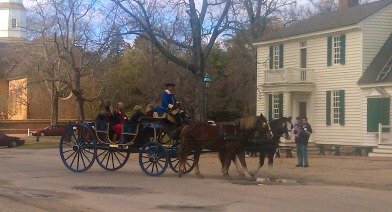 Check out my "Secrets to a Cheap Colonial Williamsburg Vacation" page, which includes tips for seeing the Historic Area for free, cheap places to eat, info on the free Summer Concert Series, and more. If you DO want to buy single-day tickets, click here for DISCOUNT TICKET DEALS, military discounts, and tips on what you can see for free! Normally, this is where I would be describing a 3-4 package deals combining Historic Area tickets with a hotel stay, free breakfasts, family deals, romance deals, and multi-park deals. 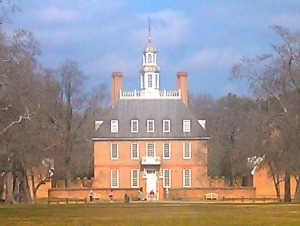 Just one problem: Colonial Williamsburg hasn't posted any package deals. This is a first for me in all the years I've been updating readers on their latest deals, and it has me rather puzzled. I know that they've been having some financial troubles, so I don't know if those package deals weren't profitable, or if they'll pick up later in the summer season. So for now, check out the DISCOUNT TICKET DEALS link above for single day ticket discounts, including how to get $10 off with your grocery store card. 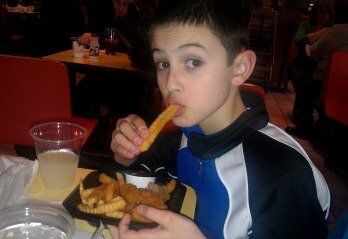 Enjoying fried chicken and fries at Pierce's BBQ in Williamsburg. Want the best-rated Williamsburg restaurants? Readers of The Virginia Gazette have voted Old Chickahominy House, Peking Restaurant, Pierce's BBQ, and Berret's Seafood Restaurant among their top restaurant picks for "The Best of Williamsburg." Readers voted in 90 categories. Old Chickahominy House won for "best soup," while Sal's by Victor won for both best Italian restaurant and best pizza. Berret's won for "best crabcakes." For the full list, PLUS our family's picks for the best bargain Williamsburg restaurants, click here. The Historic Area is one point on the "Historic Triangle" it forms with Jamestown and Yorktown. Just a ten-mile drive along the scenic Colonial Parkway from Jamestown, it's also a 23-mile drive from Yorktown, which isn't far, depending on the traffic. Ah yes, traffic. At the height of the summer tourist season, it can be slow (not slow by Los Angeles standards, but slow for Virginia). So why not take advantage of the free Historic Triangle Shuttle bus? Directions - 102 Visitor Center Dr, Williamsburg, VA. The Colonial Williamsburg phone number: 1-800-HISTORY. Williamsburg is located about a 25-minute drive west from Newport News/Williamsburg International Airport, just over one hour west of Norfolk International Airport, and about 50-60 minutes east of Richmond International Airport. 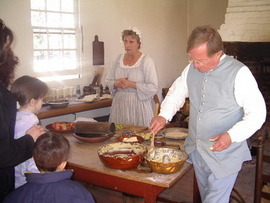 Colonial National Historical Park is just a short drive from (I-64). If you're coming from Richmond on I-64, head east and take exit 238. When you exit, look for the red, white, and blue Historic Triangle direction signs. Follow the signs to the Visitor Center (Visitor Center address: 101A Visitor Center Drive (Hwy 132Y)). If you haven't already purchased tickets, buy your admission pass there, then walk to the Historic Area or take the free shuttle. If you're traveling from the Virginia Beach/Norfolk/Hampton area, head west on I-64 and then take Exit 238. Follow the signs as I described them above. There are several free visitor guides for the Historic Triangle area. They are well worth picking up at area attractions, hotels and major restaurants. They offer dining, shopping, and attraction info, as well as area maps and...coupons! For details about these guides, which ones I recommend, and how they can help you save money, check out our "Secrets to a Cheap Colonial Williamsburg Vacation." You can find it by the clicking the link in "Admission Facts" above (on this page). Who says history is boring? The site is making history fun by offering imaginative and interactive free online games for kids. You can dress paper dolls in colonial dress, be a “Dirt Detective,” and more. There's also a "Jamestown Survivor" game offered by Jamestown Settlement. To access these free online games, to go www.history.org and click on "Kids."